OH BOY YOU GUYS, are you in for some craziness today! My wonderfully talented roommate Dayna (Daynasaur) has had this really cool project going on over at her blog, Light and Sugar, where she posts a portrait every Tuesday. They are often themed and feature crazy-cool makeup that she does herself. This week, she wanted to do a photo of someone that wasn't herself, and of course, I was happy to oblige! We began the process of turning me into a nail ninja. We had been saving this idea for a while now, and I was so excited that it finally happened! As you can see, I painted some wheels completely silver to represent my "nail ninja stars." They will knock you out with their fumes! ;) The silver on the wheels and on my actual nails, too, is Wet N Wild Silvivor. 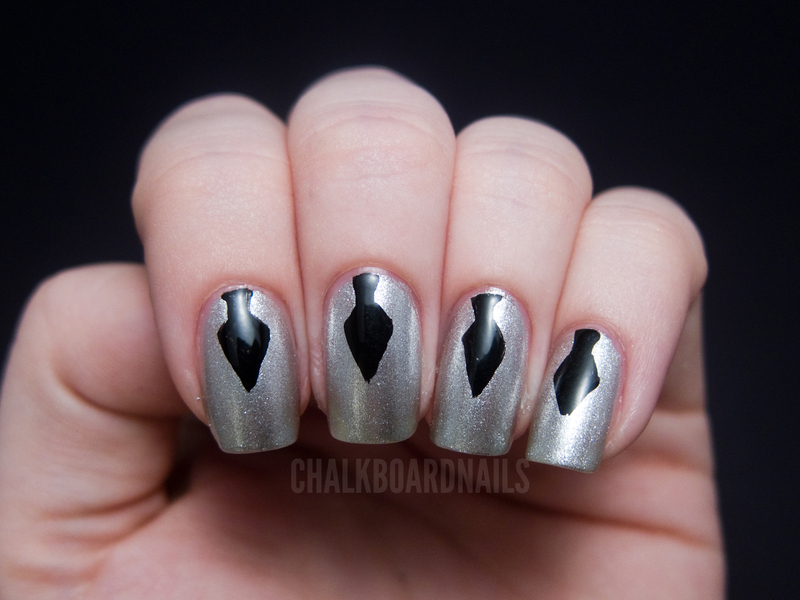 My original idea for my nails was to do a silver to black gradient, but I didn't like it as much in execution as I did in the abstract. 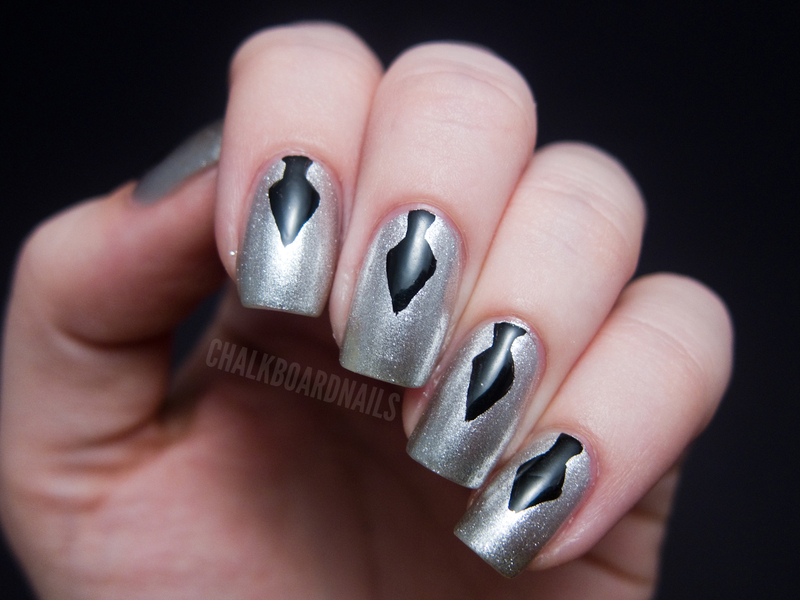 So instead, I painted some freehand kunai on each of the nails with a black creme. I love the way it turned out and it's much more ninja-specific anyway. Below, you can get a better look at the makeup that Dayna did on me for this shoot. She did a great job -- I look like a pretty fierce warrior if I do say so myself. 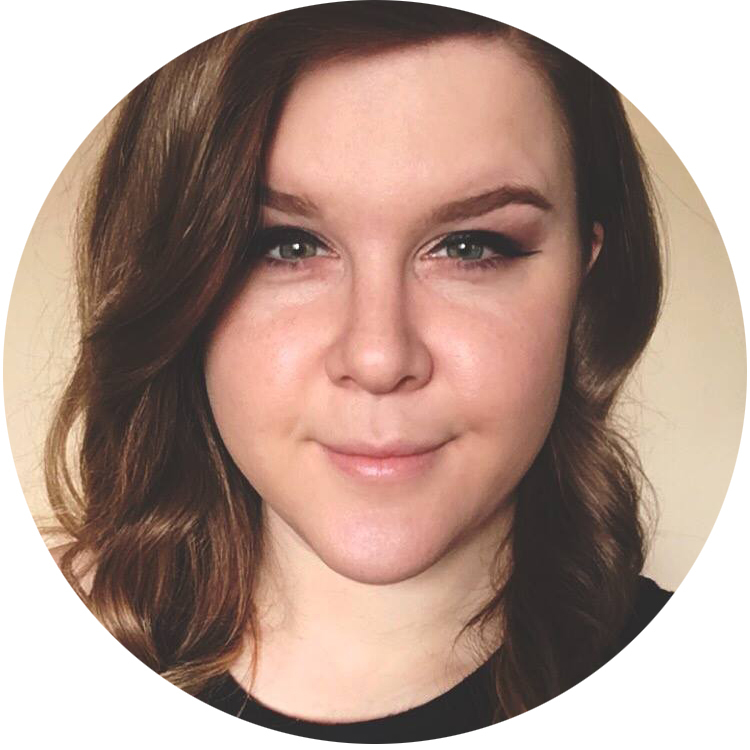 If you are interested in the specific makeup she used, she has more info on her blog. What do you think? Maybe I should be the new mascot for NinjaPolish.com? I had so so so much fun on this project, and I hope you guys enjoyed our collaboration! Check out more of Dayna's work and follow her over on Light and Sugar! Love love love love love!!!!!!!! So so so so awesome Sarah! You look like a pretty badass ninja! Love it! this is super cool.. love the makeup and the nails! I love it! This is so cool, your eyes are so pretty!!! You are really hitting it out of the park with the creativity of your nail designs and the overall Ninja look is stunning! Love it! The makeup is freakin fantastic!! Ninja polish should be making you their mascot instantly! Amazingly cool!! Love all of it! What I really love about this is that when you hold the nail wheel against your black clothing, the negative space between each nail echos the shape of the kunais you painted on your real nails. This! That was my first thought before Kunai. Really neat and spare, but pretty in a graphic way. Love all of it! Hahaha this is amazing. I love it! I love the pictures! they look so nice! Bold indeed! lol The first thing I thought of when I saw the image on your nails is that it looks just like the space between the nails on the nail wheel! Great job! This was such a fun collaboration to do with you! We should definitely do more in the future. P.S. 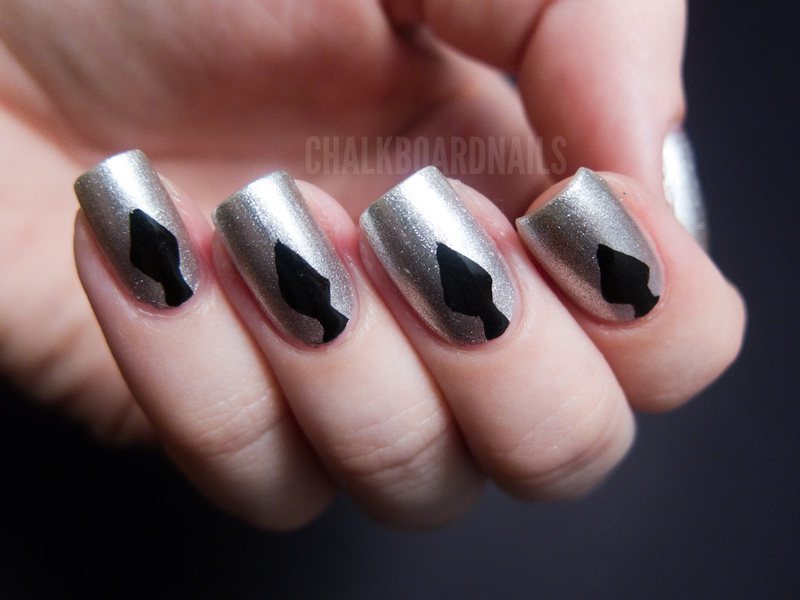 I totally didn't notice the negative-space looking like your nail design... that makes it so much cooler. "They will knock you out with their fumes! ;)"
nice work ... i like it !!! Amazing. You really should be the face of Ninja Polish! This is definitely a different and more interesting way to blog about your nails! And it is much more fun too! This is sooo awesome!!! I am in love with the nail wheels as throwing stars!!! :D I am jealous of how fun this must have been!!! I LOVE what you creative ladies came up with. This looks like it was a blast and I can't get over the nail wheels. I never would have thought to do that. I need to live with you gals; seems like it would be so much fun! This looks awesome! Love the jail wheels as ninja stars, lol. Great post! I love this!!!! I would really love to purchase the main photo as a poster. Do you think this will be possible?? 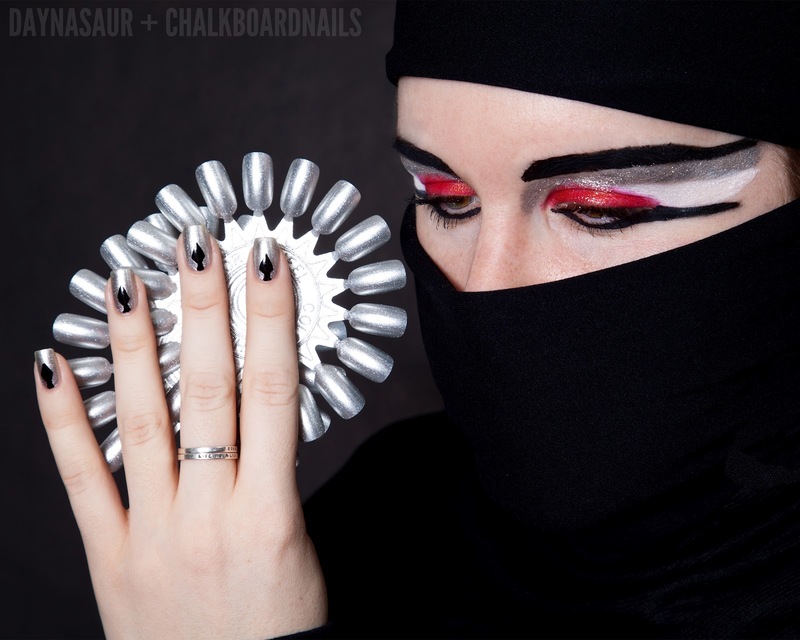 omg omg im so wanna be a nail ninja too xD maybe you can do some Sharingan inspired manicure? nevermind, i did em myself :D gonna be a blog post, can i make reference to your mani there? I am little get scary..! Primary focus of our company is on providing custom written essays. It is our aim to provide you with personalized academic assistance in preparing dissertation proposals, theses, literature reviews, MBA projects or reports. THOSE ARE MY EYES! YOU TOOK MY PICTURES AND MADE THIS PHOTOSHOP! DELETE IT NOW,YOU DON'T HAVE ANY PERMISSION TO USE MY PICTURES!